I watched 41 movies. That’s way down from 54 last year, probably due to our new 30 Day challenges. I wrote 2 Book vs. Movie posts (The Blind Side, Still Alice), reviewed 1 of my 100 favorite movies (#29 Serendipity), tried to get a few movie features going but failed due to lack of time and effort, and continued my 5 word movie reviews asking for your participation. Please consider adding your thoughts to these reviews since they count towards money for charity, maybe even yours! January was the month I saw the most movies with 7. 2016 was my most watched movie year with 13. Sadly, Hope Floats (1998) was the oldest movie I watched. I love old movies so I expect this to change next year. Cutest Couple – Sandra Bullock and Harry Connick Jr. in Hope Floats. I usually list the movie I hated the most, but this year there were 2 movies I hated and they were BOTH Nicholas Sparks movies. Message in a Bottle and the worst of the worst, The Best of Me. Every year I list my 5 favorite movies of the year, but this year I’m adding a category with just one movie in it. I can’t call it a favorite because it devastated me, but it was the best movie I saw this year. Manchester by the Sea, 2016. See it. 1. Spotlight, 2015. Worthy Oscar winner. 2. The Big Short, 2015. It’ll make you mad all over again. 3. Chef, 2014. Foodies unite! 4. 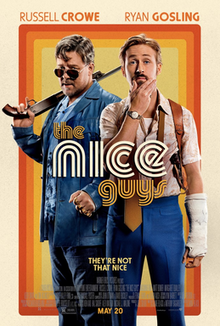 The Nice Guys, 2016. It surprises me as much as it surprises you to find this here, but I loved these two and the 70’s vibe. 5. Captain Fantastic, 2016. Viggo rarely makes a movie that I don’t love. So tell me, what was your favorite movie this year? I have plans to see La La Land with a friend this week. We hope to see Manchester by the Sea while it’s still at the theater too. I need to track my movies watched in 2017 – have never done that. We saw Spotlight at the movies and actually watched it as our New Year’s Eve pick last night as well. –so well done. I agree with all of your top choices except for Chef, which I thought was pretty good, and The Nice Guys, which I haven’t seen. I really liked the other 4.